I'm working on an OSR bestiary of strange creatures mostly drawn from heraldry and other older sources, and I've set myself the task of writing adventure seeds to go along with each entry. Great in concept, harder to execute. Once i get the ball rolling the entries write themselves, but I've got more than a dozen "herd animals", including swivel-horned goats, and a bunch of "apex carnivore" creatures (two-headed lions, horned lions, etc, etc....). Anyone have suggestions for coming up with adventure ideas? There's only so often I want to do "animal eats hallucinogenic plant and goes wild" or something like that. I just need something to work off of. A fair few bestiary beasts come with built in adventure hooks from the original folklore. For example, griffons nest in deserts that are rich in gold - beautiful, shiny gold! That's enough in itself to lure adventurers to investigate. According to Aelian, Manticores young lack poisonous tail-spines, so they are hunted so their tails can be crushed with stones to prevent them from growing spikes when they become adults. So why don't the hunters just kill these notorious maneaters - maybe spikeless Manticores are sold as tracking or guard beasts, calling out to their masters with their voices like trumpets? That's true; I should do more research. See if I can dig up some more info. There is a whole class of "griffon-type" creatures, for instance. The alce has the body of a lion and the head of an eagle; the anzu has the head and foreparts of a lion and the neck, wings, and hindquarters of an eagle; the axex has the head & wings of a hawk and the body of a leopard; duallions are two-headed lions; minoas are like axex but smaller, with a white body and scarlet plume (I might have made this name up); and a polyger is a horned lion. I'm just burning out on writing an adventure seed for a horned lion that different than that of a two-headed lion, and doesn't imitate the existing seeds for lions, tigers, leopards, or other big cats in Tome of Horrors Complete (Swords & Wizardry edition) and Monstrosities (the Swords & Wizardry bestiary). Alce have the body of a lion and the head of an eagle. They live in grassy areas with frequent broken ground, and are capable of making great leaps (+1 to hit, +2 damage attacking after a leap). They hunt in packs, encircling their prey before closing in to make the kill. Between a Rock and an Alce Place. The Denjim Hills mark the descent of the Orphian Mountains into the White Waste. Uplifted sandstone is carved into a tangled maze of canyons, pits, sinkholes, mesas, and buttes. The hills were once home to a peaceful but reclusive race, but only ruins remain now, carved into the cliffs along high ledges, accessible only by narrow stairs or removable ladders. The ruins are hard to spot, difficult to reach, and often cloaked by illusions, so finding one is quite an accomplishment. Luckily, you’ve got a map. An old prospector found a debris pile at the base of a cliff, and after some careful searching uncovered a narrow door and a staircase leading up into the cliff. He wasn’t interested in selling the map, but it seems you might not have been the only people he told. Only a few hours later he lurched out of an alley and fell directly in front of you with the map in his hand and a dagger in his back. You did what you think the old man would have wanted, grabbing the map from his not-quite cold hand and taking off with it, stopping only to pack your gear and saddle your horses before riding off into the canyon labyrinth. Now you’re here, with the rising sun at your back, its light gilding the high cliff and revealing the fleeting shimmers of failing ancient illusions above you. It’s also awoken a pride of 1d4+3 alce that lair nearby. The ground is covered with large boulders and piles of stone, and the alce are slowly surrounding you, leaping from boulder to boulder with ease and giving their sharp, shrill cries to one another. Your only choices now are to fight the alce on their home ground, or retreat into the dark stairwell and hope to find some kind of safety in the ruins above. The alce lair in a small cave in the opposite wall of the canyon. In the farthest corner of the cave, under a pile of cracked bones, is the corpse of a sekhm warrior dressed in antique bronze armor, her khopesh sword still clutched in one hand. The sword is a +1 sword, and allows the wielder to levitate as the spell once per day. The armor is rare and worth 125 gp to a collector; or twice that to a sekhm. Unfortunately, I suspect a lot of heraldic beasts were viewed more as symbolic creatures rather than a fabulous animals from far-away lands, so wouldn't have much in the way of folktales to inspire adventure seeds. Some mythological creatures are even more problematic - they be nothing more than a few lines in an ancient text or a couple of pictures - sometimes ones we don't even have names for. Or, they could just be distressingly mysterious like the Sha (the Typhonic Beast) - we've got lots of pictures of that, but it's unknown whether it's meant to be a real animal or a fabulous chimera. Some of those might simply be regional variations or local names of a standard monster. An Axex might just be what ancient Egyptians called a Gryphon, or maybe a subspecies of it with a crest on its head. Incidentally, I've just done some internet searching and haven't found any sources describing it as leopard-bodied - I'm getting "large feline" or "lion" for the body and haven't found any sites with "leopard" or "spotted coat" in the description, which makes it sound even more like a Gryphon. All I could find about an Alce (aka Keythong) is that they're either a "male griffon" - which implies that the winged ones are female - or are a "lion-griffon" resulting from a Lion and Gryphon mating. Some pictures show them with spines or plumes where a griffon's wings are, but I couldn't find any indication these helped it move or fight in any way. One OSR D&D site I came across seemed to think they were spikes for stabbing attackers like a porcupine's spines, but I couldn't find any folklore support for that ability. 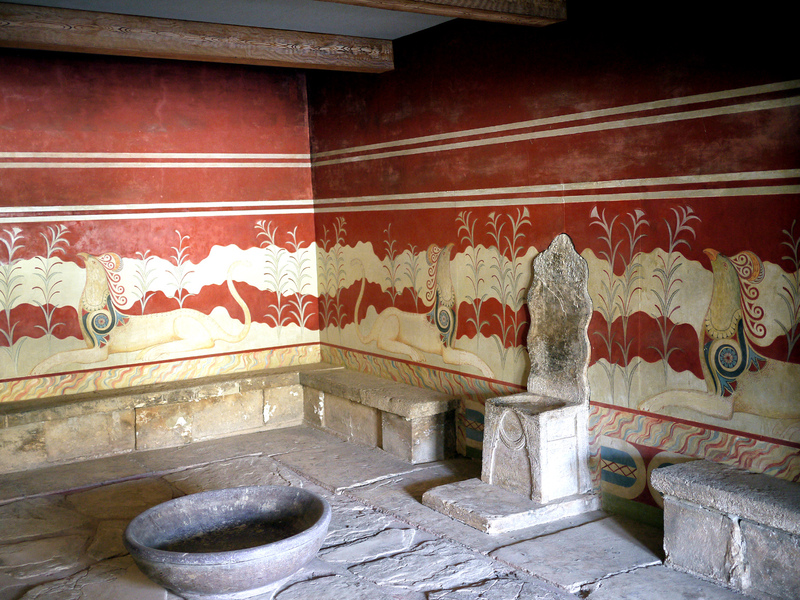 It's worth noting that some classical images of "griffons" show them without wings - like these ones in the palace throne room in Knossos - which the ancient Greeks might have considered to be "Grypes" (their name for gryphons) despite the lack of wings. It does suggest wingless griffons have a older pedigree than medieval times. An Alce guards a mound of sand and twigs with 2d4 eggs buried within it, which it will fight to the death to defend. The moment the beast spots intruders it starts making ear-splitting shrieks to warn its mate, a Griffon. If the PCs kill the Alce or steal its eggs, the Griffon will pursue the party and ambush them from out the sky when they least expect it. The Griffon may gather its pride together to assist its vengeance. The eggs are worth X gold pieces each and will produce either an Alce or a Griffon if they hatch (50% chance of each). Further on the Alce's spines, they certainly look pretty sharp in some of Heraldic pictures of a Keythong, which it sometimes augments with a pair of horns, but I still can't find any sources that say these are "combat spikes" so to speak. However, I did find sources that said these "spikes" are symbolic rays of sunlight or flames - although the "flames" in question may refer to the fumes of intoxicating incense produced by the Heraldic Panther or Pard. Hmm... maybe the "rays" indicate some the Alce / Keythong can produce some kind of light aura or smoke cloud to discombobulate its opponents. If the connection to the Heraldic Panther is true, perhaps these creatures are the offspring of a Griffon and a Pard instead of a Griffon and a Lion?